Comedy is probably the most consistent genre that animation is saddled with in the mainstream market area. It’s not like that’s a bad thing, to be honest. Comedy lends itself very well to animation, since you have full control of any kind of comedy that you want to do, from physical comedy to visual gags. As much as live-action can do great comedy, it’s limited by the fact that you can do more with animation. Unfortunately, comedic animation, unless you are Warner Bros., simply means fast movements and not much else. I think a lot of US animation studios wanting to make a comedy should look at Benjamin Renner’s The Big Bad Fox and Other Tales. Distributed by GKids here in the states, and originally a planned trio of TV specials, The Big Bad Fox was one of the films I was super excited to see. Probably for understandable reasons, it took forever to finally see this movie, and I’m happy to say, that the year-long wait was worth it. Let’s quickly dive in, and get on with this comedic masterpiece. The story revolves around three plays! The first story focuses on Rabbit, dubbed by Adrian Edmondson, and Duck, dubbed by Bill Bailey. The two are sent on an adventure to deliver a baby, when a stork crashes into a tree. Unfortunately, Duck and Rabbit are not the brightest bulbs, and Pig, dubbed by Justin Edwards, must go along to make sure the baby gets to where it needs to go. The second story revolves around Fox, dubbed by Giles New, who wants to be big and tough, but constantly fails to get a chicken to eat. After getting some help from Wolf, dubbed by Matthew Goode, Fox ends up with three eggs that hatch, and the chicks think that Fox is their mother. The final story centers around Duck and Rabbit thinking that they accidentally killed Santa Claus, and go on an adventure with Pig to save Christmas! There has been a lot of great comedies this year that have made my sides split, including Game Night, The Death of Stalin, and Blockers. However, I think The Big Bad Fox has the best comedy out of any film in 2018. Why? Because it knows what makes comedy work. Sure, it has plenty of physical gags, but the writing is also very witty, grounded, and just the right amount of sass that makes these talking farm animals feel real. Although, I have to say, the physical comedy in this film is really funny. It’s not too cartoonish or fast. It’s the right pace that you would see in Animaniacs or the old Looney Toons shorts. You can see the control the animators had over the movements that made, quite honestly, every joke land. It’s rare when a joke will land time after time after time. I think it’s because the jokes that you see in this film are pretty universal. It’s not full of gross-out humor, its dialogue is not meant to shock for shock’s sake, like Paradise P.D., and you can tell that they were careful with picking out each and every joke. Of course, good jokes wouldn’t work unless the characters did as well. 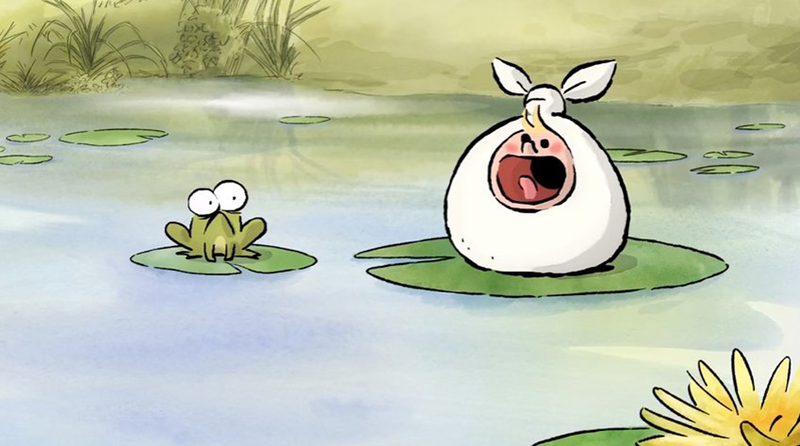 While this is definitely not a story-driven experience, I still found myself loving the strictness of Pig, the wimpy demeanor of Fox, the silly goofiness of Duck and Rabbit, and the laziness of Dog. They still have moments where they change as characters, and do grow. In terms of the animation, it’s beautiful. The same 2D-flash watercolor look from the director’s previous film gels so well. Sure, you can see multiple lines on the characters not linking to one another, but Renner’s style has always been fast, and you get the overall point. The children’s book-style look fits the stories that are told for this film. The animation is still expressive, snappy, and wonderful to look at. In terms of the voice cast, while I wish they could have gotten actors like Bobby Moynihan and Steve Blum to play certain characters, I do think the British cast was the right choice. Sure, the trailer with the English dub on it doesn’t give off the best impression, but while watching the movie, it’s pretty well synced. I can maybe say one small moment where the lips and the dialogue might not match, but it’s more of an animation issue than the script. Really, the biggest gripe I have with the film is that, while I love the play aspect, I do wish they had found a better way to weave the story together. You see these characters all the time, but due to how this was originally supposed to be three TV specials, there is nothing truly connecting one story to the other. Some characters don’t even appear in the other stories. Also, for a film called The Big Bad Fox, his story is set in the middle of the film. I guess it’s to break the pacing of the two other stories revolving around Rabbit, Duck, and Pig, but it is odd that there wasn’t a different name to the overall film. Then again, it’s based off of Renner’s graphic novel of the same name, and honestly, at this point, I’m nitpicking. While it might not be as emotionally in-depth as Ernest & Celestine, The Big Bad Fox is still an amazing movie! It’s easily the best comedy of 2018, and one of the best animated features of this year. I luckily got to see this at an advance screening, and it will be going through a limited release on October 19th, so keep an eye out for a release in your neck of the woods. If you can’t see it, buy it on DVD. The wait was worth it, and I’m happy with that. Since it’s now October, it’s time to look at something that has more of an edge to it, and maybe, be one of the most entertaining animated flicks of 2018 with Ruben Brandt Collector. Thanks for reading! I hope you enjoyed the review, and I will see you all next time.